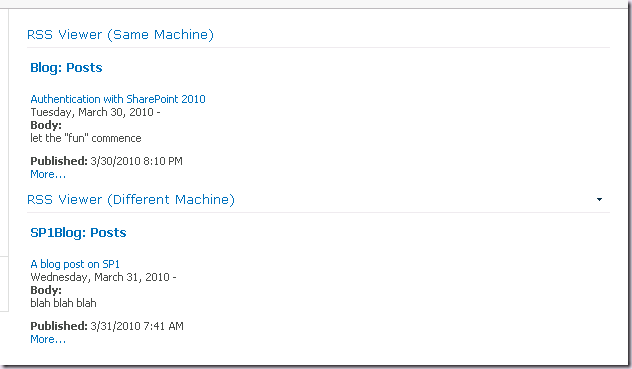 This is the first in a series of posts about using Kerberos with SharePoint 2010. 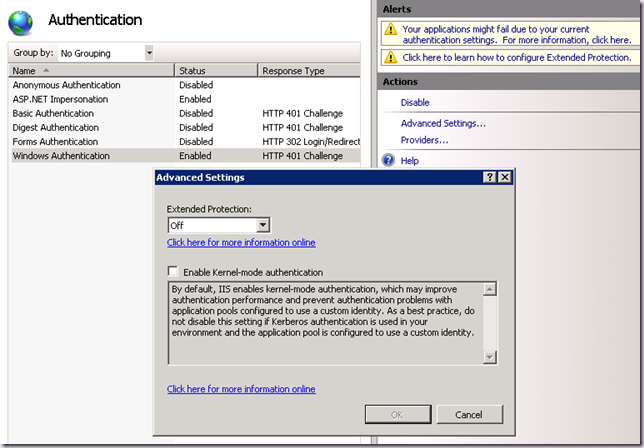 This one is an easy introduction to using Kerberos for authentication in Classic Mode. My good buddy Ted Pattison likes to joke around with me that Kerberos is dead, thanks to the “new” world of claims based identity. But it is a joke! 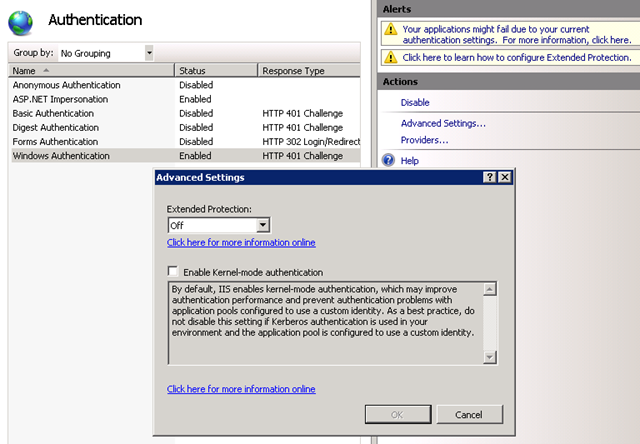 :) Kerberos is far from dead, and in many scenarios it is still the best choice for Authentication, if not Authorization within SharePoint 2010. For those of you who are fellow security geeks, you will know of course, that Kerberos is indeed a “claims based” system in and of itself. This example has a Web Application using Classic Mode Authentication (NTLM). 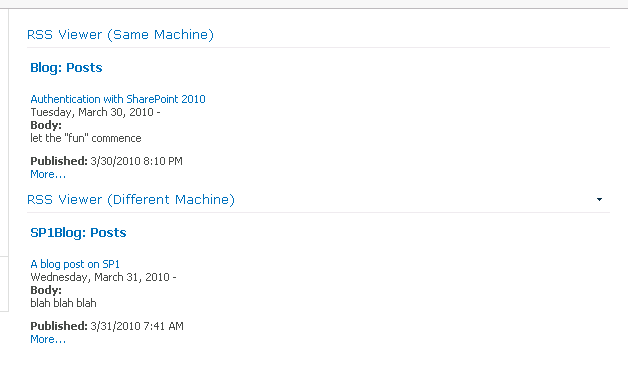 By default SharePoint 2010 sets up a web application with this configuration. The web application hosts a Team Site with a couple of RSS Viewer Web Parts. The first web part displays an RSS feed from another site in a different application pool on the same server. The second web part displays an RSS feed from another site on a different server (which is obviously in a separate application pool). Both of these sites are also configured with Classic Mode Authentication (NTLM). On Windows Server 2008, if we go ahead and configure the web application to use Negotiate (Kerberos) using Central Administration, STSADM or PowerShell, the first web part will then work. We don’t need to actually implement Kerberos (an SPN) to enable the RSS Viewer for a feed on the same server, we just need to change the Authentication settings back to the IIS default (Negotiate, NTLM). I do not recommend you configure kernel-mode authentication to use Application Pool Credentials with SharePoint 2010 at this point. If you are running on R2, then you must keep this disabled as this feature is not compatible with SPNEGO2. Windows Server 2008 R2 uses SPNEGO and therefore SPNs are required for the web application which consumes content on the same server. This is a good thing, it’s a more secure implementation. In the next post I will talk about “advanced” delegation scenarios with Classic Mode Authentication.